Disa had seven happy and healthy puppies on October 2, 2013. We have four girls and three boys. From left to right: girl, boy, boy, girl, girl, girl, boy. Three look like they will be black and white tri-colors like Disa, with some tan patches already showing. The other four will be various shades of red and brown, the more typical coloring. I really like the patterns and diversity we got with this litter. 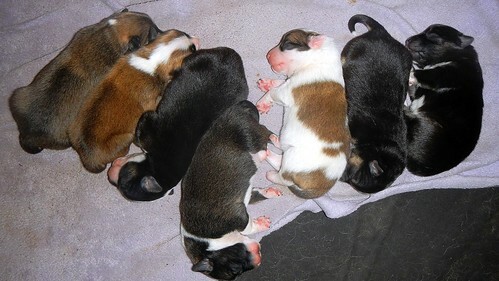 While they were being born, I noticed that number four and five puppies shared one amniotic sac and placenta. 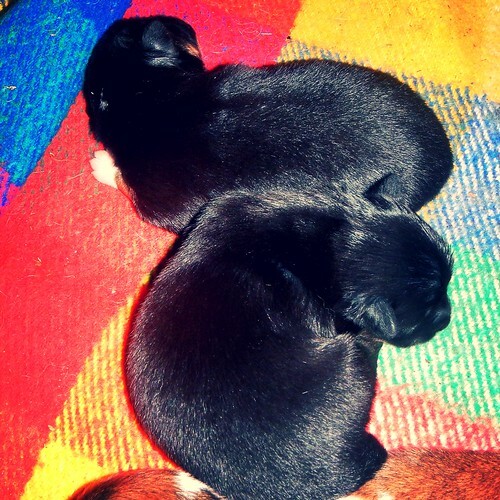 They are both almost all black, both boys, and though not completely identical, we think they are twins. The differences depend on when the fertilized egg split, but the shared placenta and amniotic sac are clear signs they are twins. It would take a sophisticated DNA test to be sure, but I don’t see the point in that, of course. It was really neat to see them emerge one right after the other as she cleaned them up, bit the cord. She’s a great mama and those instincts are neat to watch. The smallest puppy of them all is the last one to be born, the second one from the left. He’s the reddest boy with the big white blaze on his neck. He was noticeably smaller than the rest at birth, and though he is gaining right on track with the rest of them, he is staying about a day behind them all in weight. Nothing to worry about, really. When she calls them all to the milkbar, he is the last to respond, the first to fall asleep, content. All but one have double dewclaws on their back legs, but the little pied girl, third from the right, only has one double dewclaw on the rear legs. They all have singles on the front legs. I’m never sure why that really matters, but everyone always wants to know about double dewclaws. Disa had quite a bit of post-puppy confusion and disorientation, much like milk fever, so we took her to the vet to be sure everything was okay. She was a bit dehydrated, but everything else seemed okay. We’ve been supplementing her with calcium citrate, pre-natal vitamins, homemade chicken stock, and anything we can get her to eat. She’s gotten a bit better every day, and I think we’ve turned the corner with our plan, and she’s almost back to herself. She’s such a devoted mother, and the puppies are all gaining well, very happy and content. But because she struggled so much more with this litter than her last two, we won’t be breeding her again. 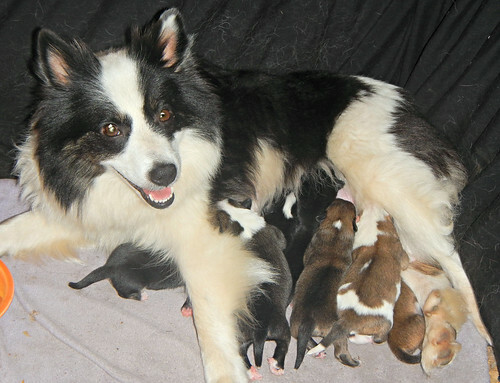 With these seven puppies, she now has 19 offspring, a great contribution to the population of Icelandic Sheepdogs. We have four of this litter spoken for, and will be seeking homes for the other three. If you’ve wanted one of Disa’s puppies, now is the time to speak up! We kept Gaela from her last litter, and will be keeping a girl from this litter as well, so her genes will be well represented on our little farm for years to come. If you are interested in one of the puppies, contact me at lisa[dot]richards[at]gmail.com . This entry was posted in Dogs, Töfradís. Bookmark the permalink. Post a comment or leave a trackback: Trackback URL. They are adorable and the mom is so pretty. Glad everyone is doing well.. Love happy baby stories!